September is one of those months when the bay and inland waters come alive. Baitfish grow into adulthood, the floating grass clears off the flats and out of the passes. 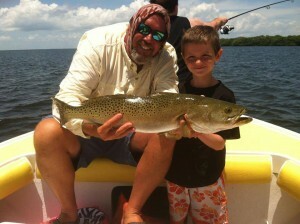 Snook, redfish, and trout, feed a lot more as the water temp drops into a more comfortable temp. 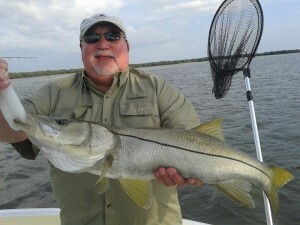 *Snook season starts on the Gulf Coast this month. You are allowed to keep one Snook per person per day, the fish must measure from 28 in to 33 in from the tip of its bottom lip the tip of its pinched tail down the lateral line of the fish. The Snook go into a post spawn feeding frenzy this time of year. They eat every baitfish in sight on the flats and around the mangrove estuaries. They were lazy and lethargic during July and August spawning season. They were lethargic from pre-spawn feeding, breeding, pregnancy, and warm water conditions. For the past two months they’ve been opportunistic feeders, not chasing live bait much, only searching the cooler waters towards the bottom for dead and crippled baitfish, crabs, and baby rays. Now they are making up for lost time and eating like crazy. Chumming live baitfish is the best way to locate the Snook, keep the Snook in your casting range and keep the Snook feeding. *Redfish start to really school up into tight, but sometimes large schools. Look for movement in the water. Look for that unique water quiver. It looks different than a school of mullet, mullet make the water look kind of like mini washing machines. Mullet make waves or wakes, redfish make humps in the water, nervous water, water that’s being pushed up. Remember if your looking at moving water and your trying to decide if your looking at a school of mullet or a school of reds look for two things, one is look for tails, mullet tail too, so really try to make out the color and shape of the tail. Also if you’re looking at a school of fish and you see a big mullet or three jump out of the school, don’t disregard the school as an automatic school of mullet. It’s common this time of year for large schools of reds to run with schools of mullet. Even though the mullet in the school are 15 inches and the redfish are 25 to 30 inches and don’t have a chance of eating a mullet that big, reds follow with the mullet schools, because the mullets flush crabs and grass shrimp up and I think reds just want to sniff the big mullet dreaming of how they can taste just one. You can keep one red between 18 in and 27 in with pinched tail. *Trout flock from the deeper cooler waters and into the shallow grass flats to meet the larger baitfish schooling into flats. Use a shrimp or greenback under a Cajun Thunder popping cork with light leader and a small jig head or small 1.0 j hook. You can keep five trout over 15 in but, only one of them can be over 20 in. *For a Charter with Capt. Joel Brandenburg of Ana Banana Fishing Company call 813-267-4401 visit www.anabananafishing.com www.thevacationrentalhouse.com For kids fishing camp info visit www.anabananakidsfishingcamp.com find him in person at Hooks @ Little Harbor Resort.